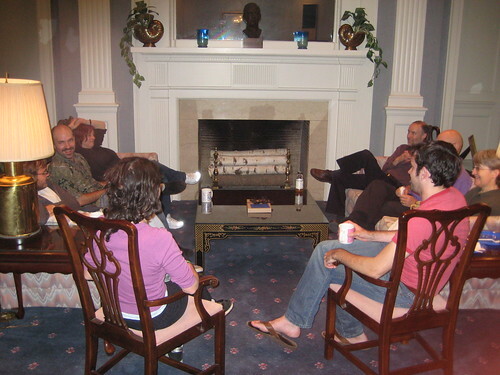 Historically, the transitions in my life have usually been under a bit of a cloud, starting perhaps as far back as age four, when we moved from Alaska to Washington state because of disagreements within the family over business matters. I started college in a state of severe uncertainty with my family; I dropped out of college with some bad feelings on a few different fronts (including my own); many of my jobs have ended either with me wanting nothing more to do with them, them wanting nothing more to do with me, and on occasion, both. I’m not certain what all the factors are which have contributed to this pattern; it would be disingenuous indeed for me to claim that I had made no mistakes, but I also think it’s fair to say that I’ve found myself in the middle of a number of awkward fits in terms of personalities involved and just what the tasks at hand were, to say nothing of overall circumstances. For example, for six months after I graduated college I worked at a bank as a teller. The work itself was not difficult, so it was not hard to be good at what I did, and the co-workers were nice; the trouble was that as the only man in the teller line at a bank with a lot of older clients, a certain cross section of the customer base felt quite empowered to be utterly and relentlessly nasty to me in a way they would never dare with a woman. If one of my female colleagues were to ask one of these “gentlemen” for their ID before cashing a check or opening a safe deposit box, they might have grumbled a bit, but they wouldn’t make a scene. When I asked? “I’VE BEEN BANKING HERE THIRTY G*DD*MNED YEARS AND NOBODY’S EVER DARED TO ASK FOR MY ID! WELL, YOU’LL G*DD*MN WELL REMEMBER WHO I AM FROM HERE ON OUT, I PROMISE YOU THAT!” After I would come back from the bathroom, having finished crying, my manager would do her best to explain that it wasn’t my fault, I was doing my job, I was doing exactly what I had been trained to do and the customer needed to understand that, but at the same time, they weren’t going to do anything to encourage those particular customers to treat me differently, because, well, we wanted their money. As soon as I was able to get out of there, I did, I couldn’t drive out of the parking lot fast enough on my last day, and I have never darkened the door of that particular financial institution since. Ironically, the situation was exactly the reverse at my next position, where my customers were perfectly satisfied with what I did for them; rather, it was my boss who made my life miserable. I moved on from there without even a handshake from that particular supervisor — simply, “Goodbye”. 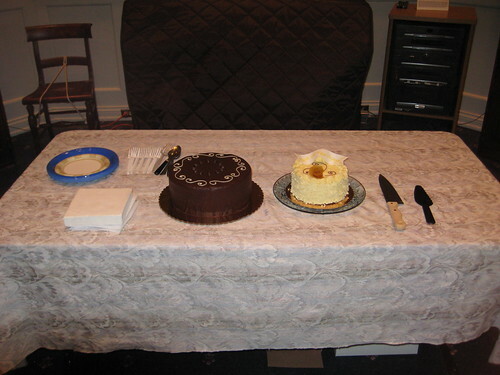 Happily, far from not even getting a handshake, my colleagues at the Archives of Traditional Music threw me a party today, my last day there. They brought two absolutely delectable cakes from Angel B’s, A Galleria of Cakes, they bore gifts, and they made me feel very appreciated for my time there. Of the six years I’ve spent at IU in various capacities, the last fourteen months have without question been the high point; I’ve enjoyed what I’ve done and with whom I’ve worked, I leave on good terms with all of those people, I leave not having counted down the seconds till I could quit, and without anybody saying to not let the door hit me where the good Lord split me. To put it in show business terms, I’ve been able to leave ’em wanting more, and in a good way. It’s a really nice feeling. I close this chapter excited to see what happens next, but sad to be leaving this behind. I am moving on to the next thing without desperation for perhaps the first time in my life. The only downside is that there were a couple of key absences today, people who have been out sick all week, and it would have been nice to say goodbye in person. I’ll just have to go back and show them my pictures in August. 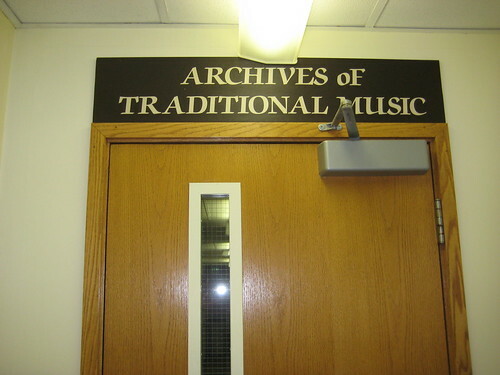 Thanks for a great year, Archives of Traditional Music. This is only tangentially related to my usual topics, but I find my friend and Archives of Traditional Music colleague Patrick Feaster’s work on what he calls paleospectrophony to be fascinating, even if I am utterly unqualified to say much about it beyond “Wow, cool.” For obvious reasons, the section on how his technique can be used on neumatic musical notation is of great interest to me (although he has said that Byzantine notation would not work with what he does). Give it a look.